Somehow nobody remembered that the USG manufacturing facility is just across the river from our campground in Cloquet. All night long there was a constant loud humming from the operating plant, as well as trains moving in and out, blaring their whistles. It was a minor nuisance to most of us, however, except maybe Jack, whose sleep was interrupted, and John, whose comment in the morning was “What trains?” I honestly think John could sleep through anything! We waited a bit for Anni’s sausage egg bake, nobody in much of a hurry to get going this morning. Some mornings are just slower than others, and this was shaping up to be one of those mornings. It was late morning by the time we reached the trailhead for the Munger Trail in Carlton. John has been pumping up a slow-leaking tire for the past few days, but it was completely flat today, so he opted to change it out before riding. 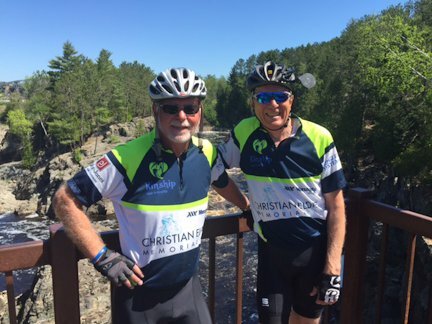 We initially rode north about a mile to the scenic bridge over the St. Louis River; this has become part of our yearly ritual. We have all been to this site previously, but it is still an amazing view worthy of the diversion. Doug and Anni even walked down to take in the views. After some photos on the bridge, we headed back through Carlton and on to the south. The wind was mostly pushing us from the north, so it was shaping up to be a great ride today. But not so fast. 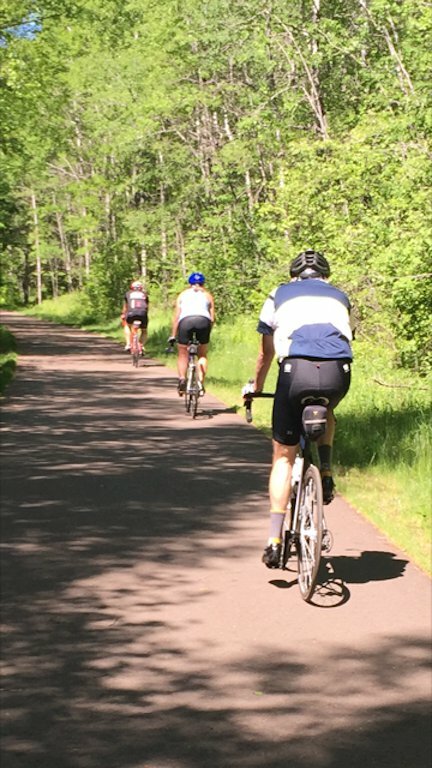 About 9 miles into the ride, Kathy’s front tire caught a large bump on the path, and she was launched from her bike into the tall grass on the side of the path, sliding on her back until her head hit a tree, stopping her completely. Kathy was only a small distance behind John and Jack, so she crawled to the edge of the trail and yelled “John!” as loud as she could. It looked to Kathy like they didn’t hear her, so she shakily stood and picked up her bike. When she looked again John and Jack were riding back toward her. John thought he had heard a faint voice crying out, so they decided to stop. Looking back they saw that Kathy was on the ground, so they had quickly reversed course. Other than some bruises and scrapes and cuts, Kathy seemed to be ok, but John called Doug to swing by with the RV to pick her up. Her day of riding was over. Doug took John’s call, pulled over to the side of the road, and walked back to the pickup to let Anni know what was going on. When Anni saw him, she knew instantly that something had happened to Kathy…call it twin’s intuition. They were on I35, and it took them a while to get off the freeway and back onto the county roads, but they still made it in about 15 minutes. John had also called Dennis, who was pedaling back into the wind at a furious pace. 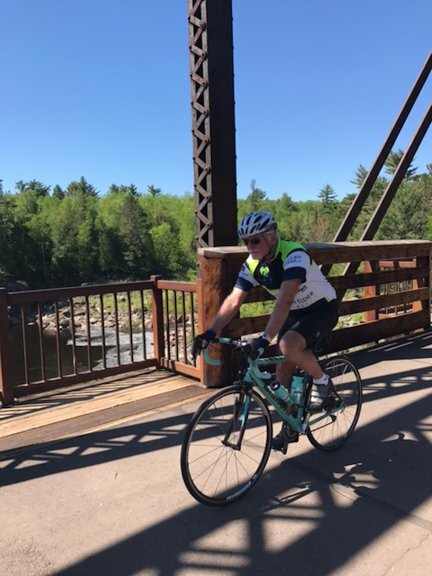 Kathy also called Dennis to let him know that she was alright and that he should continue to the stop at Moose Lake. Dennis did his own concussion protocol over the phone. Trick question: “What day is it?” Most of you don’t know this, but Kathy frequently does not know what day it is. “Monday, June 5,” was the reply. Was this a good sign or a bad one?? After this experience, our ride was fairly normal, with stops in Moose Lake and Finlayson before finishing in Hinckley. On the ride to Hinckley, Dennis had an encounter which normally would have been fairly interesting, but which today was very anti-climactic. A deer in the woods beside the trail bounded right in front of him as he locked on his brakes and swerved to the left. The near-miss was within 1 – 2 yards; Dennis surely would have been on the receiving end of that collision. After quick showers in the RV, we loaded everything and headed back toward home. It will be an overnight stay in our own homes before taking off again for the final three days. Jack and Kathy are done with their rides, and Doug and Anni are done with their leg as support drivers. Thanks for the memories and for all of the assistance!